Since 1943, the Hollywood Foreign Press Association (HFPA) holds an annual award show featuring highly acclaimed movies and TV series. Comedian Andy Samberg and actress Sandra Oh hosted the star-studded event on Jan. 19 and was aired live on NBC. Throughout the three hour show, the two entertainers warmed up their audience by addressing the Oscar host controversy and playfully “roasting” the attendees. Near the end of their monologue, Oh gave a sincere and emotional speech about being the first Asian host for the Golden Globes. The rest of the night was filled with light-hearted humor that rarely used the go-to political jokes. Though many found their hosting style unique, some believed their routine could have been more natural. 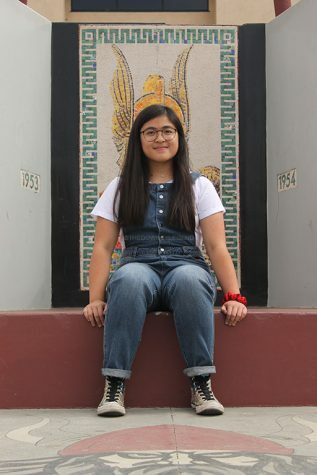 Kianna Maglaqui, 12, shares her opinions on what the Golden Globes should improve for their next show. The ceremony awarded actors and actresses whose performances stood out in each respective category. Some of the winners included Glenn Close for Actress in A Drama Motion Picture (The Wife), Mahershala Ali for Supporting Actor in a Motion Picture (Green Book), Olivia Colman for Actress in a Musical or Comedy Motion Picture (The Favourite), and Ben Whishaw for Supporting Actor in a Miniseries/Television Film (“A Very English Scandal”). The decision to give Patricia Arquette a Golden Globe for Best Actress in a Miniseries/Television Film attracted attention on social media. Multiple viewers were shocked by the outcome as they expected Amy Adams to win for her performance in HBO’s limited series “Sharp Objects”. Among them are film enthusiast Emily Rivas, 11, who is a fan of Adams and the show. Bohemian Rhapsody’s win for Best Drama Motion Picture sparked controversy within the social media community. The portrayal of Freddie Mercury’s life was deemed inaccurate and disrespectful to his legacy by certain Queen fans. The film’s ties with accused sexual harasser Bryan Singer also received criticism as it went against the MeToo movement. A fan of Bohemian Rhapsody and the band itself, senior Brandon Castro believes the director’s actions should be separated from the entire project. The Golden Globes is only the start of awards season. Other upcoming award shows include the Screen Actors Guild Awards on Jan. 27, the British Academy Film Awards on Feb. 10, and the Oscars on Feb. 24. ‘Tis the Season for Christmas Movies!